Supports entry level PCs up to 75 minutes during blackouts to enable shutdown without data loss. Regulates brownouts as low as 151 and over voltages to 282V back to usable 230V nominal levels without using battery power. 8 IEC320 C13 outlets with complete AC surge suppression. C14 inlet accepts user-supplied AC power cord with country-specific plug. USB port and cable enables unattended shutdown in the case of extended power failure. Dataline surge suppression protects standard dialup/DSL or Ethernet line connection. Audible alarm and 4 front panel LEDs offer complete UPS and line power status information. 1500VA power handling ability supports a variety of sensitive electronic equipment. 4.5 minutes full load runtime (1500VA), 13 minutes half load runtime (750VA). Battery life will vary depending on the product configuration, product model, applications loaded on the product, power management setting of the product, and the product features used by the customer. As with all batteries, the maximum capacity of this battery will decrease with time and usage. Runtime is further expandable with the addition of external battery packs. Supports hot swappable battery replacement via built-in access panel. Optional PDUBHV10 bypass PDU enables hot-swappable UPS replacement with no disruption to connected equipment. Power problems—including blackouts, brownouts, power surges and line noise—threaten your investment! They can damage or destroy PCs and other expensive equipment, wipe out valuable data and files, and degrade component performance. Get protected against these all-too-common power threats with Tripp Lite’s OMNIVSINT1500XL Line-Interactive Tower UPS System. For countries and regions that use 230V mains power, the 1500VA/940W OMNIVSINT1500XL is capable of powering a PC up to 75 minutes. 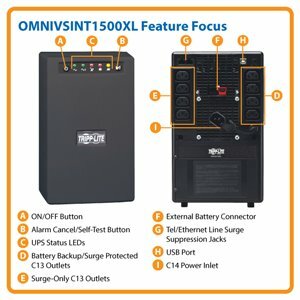 With additional features like automatic voltage regulation, surge suppression, line noise filtering, 8 C13 outlets (6 battery backup, 2 surge protection only), and support for additional external battery packs, the OMNIVSINT1500XL is a comprehensive power protection solution for PCs and desktop workstations. A USB port allows for safe unattended system shutdowns and file saves during extended power failures. The OMNIVSINT1500XL comes with a 2-year warranty. UPS battery backup support lets you to work through short power failures and gives you enough time to save files and perform an orderly system shutdown in case of a prolonged blackout. The OMNIVSINT1500XL’s internal battery provides 13 minutes of battery support for a half load (470 watts) and 4.5 minutes for a full load (940 watts). During normal operation, incoming utility power keeps the UPS battery fully charged so that backup power will always be available when needed. Runtime may be expanded by connecting optional external battery packs, sold separately (compatible Tripp Lite external battery packs: BP24V15RT2U, BP24V48-2U, BP24V70-3U). AVR protects your equipment from incremental hardware damage, data loss and performance problems that can be caused by low-voltage conditions (brownouts) and overvoltages. The OMNIVSINT1500XL automatically corrects brownouts as low as 151V and overvoltages as high as 280V back to 230V without drawing on battery power needed to support equipment through blackouts. A sudden power surge or spike on an AC, phone or network line can damage or destroy electronic components and wipe out irreplaceable data. The OMNIVSINT1500XL features a 340-joule surge suppression rating to protect connected components and data from the harmful effects of power surges. One set of tel/Ethernet (RJ45) jacks provide surge protection for a standard phone or network connection. Various electrical and radio sources can cause disruptive interference on the AC line. This line noise is a common cause of incremental hardware damage, data corruption and audio/video performance problems. The OMNIVSINT1500XL incorporates technology that filters out disruptive line noise, preventing it from affecting your equipment. The OMNIVSINT1500XL contains a USB port (USB cable included). When used with PowerAlert software (available for free download at tripplite.com), this USB port enables safe unattended system shutdown and file saves in the event of a prolonged power failure. The OMNIVSINT1500XL comes backed by a 2-year warranty. The OMNIVSINT1500XL is also manufactured in compliance with strict RoHS guidelines to minimize the use of hazardous materials, and its replaceable internal battery is 100% recyclable.